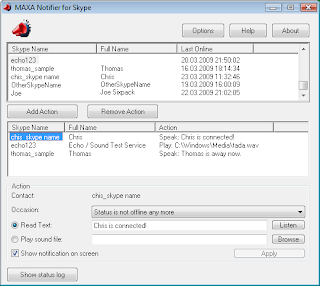 MAXA Notifier is a Skype Add-On that notifies you about your individual contact's state changes audibly. So you only need to be in hearing distance of your computer to be informed for example as soon as important contacts become available. MAXA Notifier supports Wave, Midi and MP3 files and can even read text messages you enter via the text to speech engine. Additionally, you can specify whether you want to have a message box shown to you. Notifications can be set for each, individual contact and for different occasions.